Christine DeMerchant's boat club. 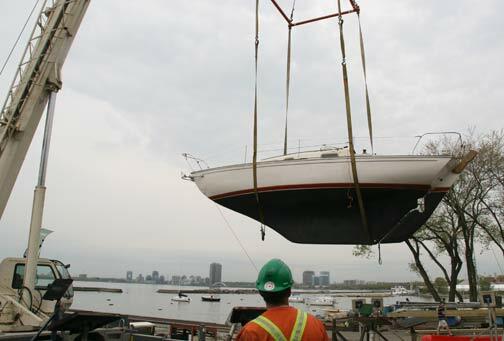 Toronto Sailing and Canoe Club keelboat launch day. 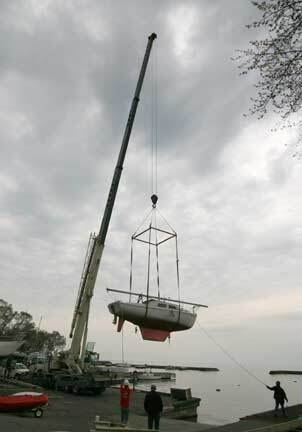 Have you ever wondered how keelboats are taken out of the water in the Fall and put back in in the Spring? The reason a square frame is used is to keep the lines from squeezing in the sides of the boats. The steel support is connected to a pulley and steel cable. Its a surprisingly small cable, maybe a half inch. 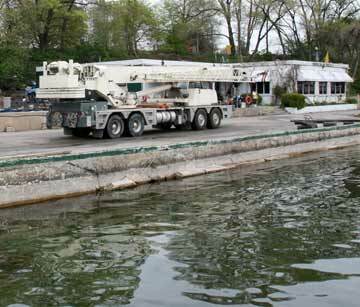 The boats are loaded on the support slings in a couple of minutes and the operator deposits the boat by the dock in even less time. 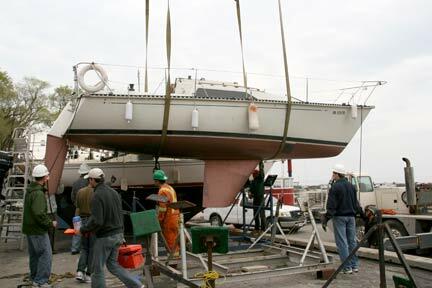 The whole process takes about 5 minutes per boat. Some keelboats are not very big or heavy but some are quite large, 30 or more feet, and weigh well over a tonne with their lead or cast iron keels. My Tanzer has a cast iron keel that weights around 2900 pounds. The skill of the operator is quite impressive. He seems to be able to control his load without getting much swaying motion or any jerking. The boat just glide through the air and land gently in the water inches from the dock. We also launched a new dock being built. It still needs some deck boards but it was feared that these would make the dock too heavy to launch easily. I'm not sure how they intend to lift it out in the Fall though? The empty cradles can be folded up and get piled up neatly. We rent a forklift to do this. 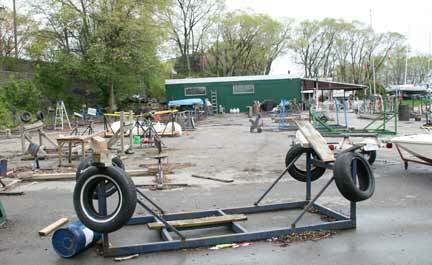 Once the yard is cleared we can use it to store the sailing dinghies. The club houses all kinds of boats. Wayfairers race all summer. We also have Lasers, Optimists, and at least one Skerry!!! There is an active canoeing group with kayaks, canoes and large Dragon Boats as well as a few large outrigger canoes with amas. Soon the crane is tidied up and ready to leave. A good thing because the hourly rate is quite high. 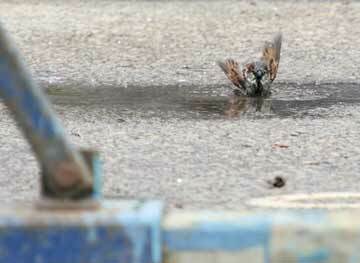 We had a short thunder storm and the crane had to telescope it's extensions inward and stop till the storm passed us. Calm returns to the yard and a little bird get the chance to take his bath. Meanwhile we go home and get ready for a new sailing season.